Early spring is a great time of year to reevaluate your lawn and landscape water needs. University of Florida studies have shown that in homes utilizing automatic sprinkler systems, 50% of total home water consumption in the summer comes from running a sprinkler system. When a homeowner is using utility water, they are typically charged twice; first for bringing the water in and second for wastewater fees. Estimated costs for irrigating a 5,000 square foot yard range from $5-$25 per irrigation session. So how does one cut down? Many of our clientele ask how long an irrigation system should be run and how much water plants should get. 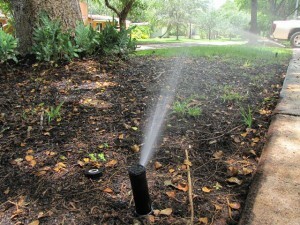 Ideally, turf and landscape plants should get ½” to ¾” of water per application. The frequency of application varies by plant needs, weather, and soil type. For very sandy soils, some specialists have recommended applying less water at a slightly more frequent rate, since sandy soils are unable to hold water in the root zone of plants for long. Mulching around plants and amending soils with organic material can help improve a soil’s water-holding capacity. A simple sprinkler calibration can be conducted by spreading empty aluminum cans around one’s yard, and turning on each sprinkler zone. Run each zone for 30 minutes and measure how deep the water is in the cans. If the water depth is within the recommended amounts, no changes are needed. However if it’s not deep enough or greater than ¾” of an inch, run times should be adjusted accordingly. If some of the cans receive a noticeably different amount of water than those adjacent to them, it is a signal that the reach of the spray heads is not adequately set and should be corrected to make sure the entire landscape has even coverage. The primary goal of supplemental irrigation is for the plants’ root zones to be wet, but not saturated or too dry. Ideally, established lawns and landscapes should thrive on rainfall after initial establishment, and only take irrigation in longer periods of drought. However, this is contingent on the planting of Florida-friendly vegetation and a homeowner with a keen eye to the condition of one’s plants, who is willing to turn the sprinkler system to “manual” and wait for his or her plants to start drooping before turning on the water. In reality, most homeowners find it difficult to take this much time and care with their irrigation system, and opt for the “water every two or three days whether needed or not” approach, even in parts of the state with water restrictions. In fact, anecdotal evidence seems to show that homeowners only allowed to water lawns one or two days a week will overdo it just to make sure their plants survive. Luckily, new technology exists that can take the guesswork out of irrigation for a homeowner, while keeping plants alive and conserving water at the same time. “Smart” irrigation systems include soil moisture sensors and evapotranspiration (ET) controllers. Soil moisture sensors (SMS) use electrodes buried within the root zone of turf, which are calibrated to a certain level of moisture in the soil. The system is only allowed to run when water levels drop below a preset threshold. ET (evapotranspiration) controllers monitor weather conditions on site or from a nearby weather station, using satellite signals to determine when plants will need additional water.